The Gotheborg.com Help and Information Website and Forum is probably the largest collectors' resource on the Internet to specifically provide help to collectors of Antique Chinese and Japanese porcelain. Its purpose is to be an unbiased help and information page for collectors of Antique Chinese and Japanese porcelain and by this keeping alive a vast amount of tacit knowledge in this most difficult area of collecting. On the public part of this site, there are more then 2,500 pages, entries and new and classic documents on Antique Chinese and Japanese porcelain. All written, added or published here over a period of some twenty years, beginning December 1998. A Discussion Board "so comprehensive that it boggles your mind"
Beside this is the real - members only - site. A collectors Forum - or Discussion Board - so comprehensive that it boggles your mind. Once a member, here is where you can post your questions about your own pieces, and participate in a separate collectors' Discussion Board. This forum has been widely recognized for its polite manners and highly qualified and unbiased help. The number of messages and images in the Forum are today well over three hundred thousand respectively which makes it - by far - the largest research database in this field in the world. The membership is by application only and kept to a maximum of five hundred so that the quality of the discussions will not suffer. 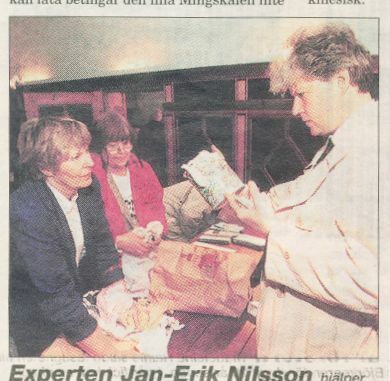 The person who who have put this thing together would be me, Jan-Erik Nilsson. I live in Sweden and have collected, studied and worked with antique Chinese pottery and porcelain during my entire professional life. In 1963, as I moved to the city of Gothenburg in western Sweden, my interest grew in Chinese porcelain and other treasures that were brought here by the Swedish East India Company (1731-1813), whose world-spanning voyages always departed from and returned to Gothenburg. This interest led to me to help initiate the project of recreating and reviving our 18th century Swedish-China trade by actually building a replica of a wooden frigate used at the time - the East Indiaman Gotheborg ship - and have this full scale replica actually built and sent off again to China for a new promotional trade voyage, which it did in 2005-2007. A marvelous adventure that - as unlikely as it sounds - really happened. To further my own personal interest in old porcelain and the human and cultural exchange aspect of the old China trade, I decided to keep the domain name Gotheborg.com and develop this into a web site where I could further my personal interests in Asian Art. I also felt I would like to share and compare whatever knowledge in this area I had managed to pick up over the years, with other collectors. Some of the initial research that went into the Gotheborg.com page in 1998 was already published by me in support of the reconstruction project of the Swedish East Indiaman Gotheborg (lost on homecoming in 1745). All the time until April 2014 the yellow background used on most of my web pages here was a scanned sample of the paper used for the original founding document - The (Privilegium) - of the Swedish East India Company of 1731. Most of this early material was aimed by me to become a research resource about the Swedish East India trade in general, both material and humanistic. When this, by and by, was taken over by public libraries and museums I could focus on my personal area of interest - the human side of the travels, the tracks of cultural exchange it had left - and the Chinese porcelain pieces that was brought to Europe through this trade, begun by the Portuguese in the 16th century. Gotheborg.com was then something I just wanted to do myself, as a tribute to a life-long interest. Instrumental in this was the inspiring example set by my friend and mentor, Professor Bo Gyllensvärd, who always listened to and encouraged any would-be collector approaching him for help. I felt I owed something back and very much wanted his and certainly many other great collectors and scholars throughout history, knowledge, to be kept alive. I also felt that this was important and far too difficult to expect any individual or budding collector to start at scratch, trying to figure out all this material knowledge - that literally would take a lifetime to digest - for themselves. We just needed to put this down somewhere, keep it for the future, and pass it forward. In Bo's interest in the minyao wares from the people's (non-Imperial) kilns, Bo Gyllensvärd was far ahead of his time, probably somewhat fostered by his close relation to Carl Kempe (1884-1967) and his collection at the Ekolsund Castle, the 'Sung Shards', collected by Dr. Nils Palmgren, whose editing and publication largely fell into Bo's hands and, at the very beginning of Bo's career, his work with the many Neolithic pots collected and brought to Sweden by Johan Gunnar Andersson from the Yangshao and other regions in China. Much of these utilitarian wares showed stunning artistic ability for those who had the understanding and heart to see it. Other members of the Gotheborg Discussion Board also have similar homage to pay to their own mentors, them being friends or scholars. Another consideration was that I as a collector, amateur and student in this field, felt "alone" compared to the people active in the antiques trade. I felt that we as collectors were at the bottom of the food chain, so to speak. The dealers and professionals had their meeting places and their fairs, where they could meet and exchange news and gossip, but that we as buyers and collectors were shut out of this. So, I decided to try to create an on-line area, a virtual collector's club, where collectors could meet and discuss their own side of the issues, keeping all advertising and business interests out. This was the beginning of the Discussion Board. I had some experience in Antiques Road Show types of events at museums and antiques fairs, which I thought was really fun. From these events I knew how curious people were about the mysterious pieces left to them by distant relatives, now embellishing shelves or dining room walls. Porcelain decorated with oriental-looking figures in strange river landscapes and embellished with oversized flowers and maybe with some mysterious characters on their bases. What I wanted to do was to hold these authentications on-line - in "broad daylight" so to speak - where anyone with a differing opinion could have their say too. I also did not mind just sitting back and listening, since this is a very difficult area and no one knows everything. However, at that time the internet was young and any commercial software that could do this did not exist. This was the time of manual HTML coding - page by page - if you wanted to put anything online. I began by inviting visitors to email me questions and pictures. I then made a web page out of this and published it, one by one, together with my answers, for every area where I felt I had anything, however small, to contribute. To get feedback, comments were encouraged, also via email, and I also opened a public Guest Book. The 27th of June 1999 I started an email-based "discussion list", initially with an organization called ONElist, which in February 2000 merged into something called eGroups that eventually was sold to Yahoo. Old-timers who experienced the mailing list period will probably still remember with a smile the flurry of activity every new question that was posted would set off. Everyone jumped in and tried to be first who posted an answer. Sometimes we dived headlong into the discussion with a completely wrong answer but, surprisingly, not that often. It was also crucial that any question was dealt with at once, because as soon as next question was posted, the first would fade away and the interest would be shifted onto the next and the next question. I could not help thinking this was an enormous waste of efforts that was just flushed out into cyberspace but it was all new. It worked and good people signed up one by one. A few moths later, in April 3, 2000, I got an email from Simon Ng at the City University of Hong Kong, who was also a dedicated collector and wanted to be added to the discussion list. When in July the Marks Section was initiated through a donation of Chinese and Japanese porcelain marks by Karl-Hans Schneider in Euskirchen, Germany, Simon now became the ideal partner in creating the Gotheborg.com CHINESE MARKS section. 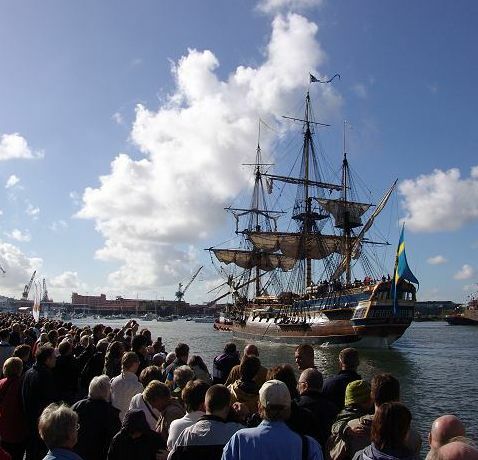 Today this section is one of the most referenced public pages on the Gotheborg.com site. A few months later, the 1st of September 2000 was also a lucky day, because that was the day when Mike Vermeer of Vermeer & Griggs in Los Angeles emailed me and asked if he could put up a link to my site. He explained that he had wanted to set up something similar but felt he could as well help me out in my efforts instead of doing it on his own. Mike eventually joined in on the discussion list, and later the Board, where his writings on Imperial porcelain and Chinese taste, special glazes and monochromes remains as beacons of scholarship. In April 23, 2003 Yahoo had grown too busy making money to fit our needs drowning our messages under tons of advertising, so a new platform was needed. By recommendation from of our member Lee Inness-Brown, I bought and integrated a very solid discussion board (forum) software with my own website, which we still use. From now on, any number of discussions could go on at the same time, organized into near one hundred different topics. Members could easily upload any number of pictures and choose from a list which discussions they wanted to follow via email, or via the web browser. And best of all, we could keep everything we wanted to in archive, and nothing would ever disappear due to some company or other service being sold, going bankrupt or change their policies. By the end of 2003 I started to piece together all the bits and pieces of information we were often referring to, and collected all this into the Porcelain Dictionary and Glossary of Terms we now have. In February 2005 my admiration for Georges Bouvier and his specialist's site on Kutani grew into an invitation to join forces. This had actually already begun with John Wocher joining us as a moderator in June 2004, about a year earlier, from which time the Japanese section rapidly became at least as active as the Chinese section. I know - and am sorry - I need to leave out so many moderators and important contributors - like Tommy, Sal, Hans, Matt, Ian, IP, Lye, Keith, Koh, Tim, David, Sally, Sandra, Elyce, Trillian, Joan, Mike Harty, David, Ed, Arno, Giovanni and many, many more - who have added their special flavor to the board, and contributed so much to our currently 300,000+ posts. But the point is that this board is a joint effort and I think of unique proportions, in particular when it comes to the quality of the help offered. More often than not, I think we do get things right here before we are done talking about any single item posted by our members. Around 2005 our archive of discussion board messages and pictures had grown so large that it was not feasible to run it from a hosted web hotel. The bandwidth cost alone for content distribution was getting out of hand. On Friday the 3rd in January 2006 I signed the contract to have the Discussion Board moved to a separate server of our own. At this time we also jointly decided to introduce a modest membership fee to cover the cost of this server, while keeping the original policy of our original list to keep it unbiased by any commercial considerations, meaning - no advertising and no corporate sponsorship. Just us, do or die. Today (in 2019) our Discussion Board active archive keeps more than 350,000 messages and pictures in our own private database. If you decide to join, you will soon find your way around and most certainly have begun to make new collecting friends, from all over the world. Most welcome as a member.